Enjoying the laid-back lifestyle of living in a log home is indeed a dream many people have. Living in a log home isn't all about the comfort of a relaxing atmosphere or the rustic appearance of the home, it's also about the environment that has weathered the home and given it its unique character. Unfortunately, this same environment that has made the log home lovely has also spent plenty of time trying to disintegrate it. This is just something that happens in nature when a material such as wood is biodegradable. 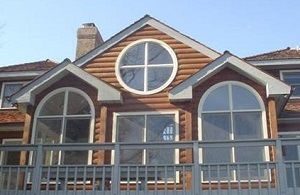 Ensuring that your woodwork on your log home is treated and maintained properly is vital. The wood of the logs, decking, siding, trim, and more of your home needs to be sealed with the appropriate substances that keep elements from attacking the wood. For instance, when you picture a log home in your mind, you're certainly not thinking of an old, broken down shack! You're thinking of a beautiful log home, with smooth logs that have been lovingly rubbed, waxed, and looks gorgeous. The decks are stained and beautiful, sealed against the salt, sea, and sand. But how are log homes so beautiful and what sets them apart from old shacks? Maintenance and the right treatments that keep the wood beautiful instead of dry, cracked, and broken down. If your log home is in need of attention, or your wood deck looks gray and faded, don't wait any longer, let us help you take care of your log home or other wood surfaces of your home. If you own commercial property here in NewBern, you'll be interested in our pressure washing, softwashing, deck cleaning, and restoration services. Your commercial property has many surfaces that need to be kept clean and looking great. Old decks can be restored, rooftops cleaned, siding cleaned and restored, sidewalks washed, exteriors painted or sealed, and more. Our expert wood cleaning and restoration services will ensure your commercial property is sealed with appropriate materials that will keep your customers interested in visiting your business. After all, what they see when they drive up or by is their first impression of your business. Put forth your best and you'll get customers who trust the quality of your services or products. Do You Need Wood Restoration Or A Pressure Cleaning in New Bern, NC? Then give us a call 252-266-9457 or complete our online request form.